D'jemaa el Fna (sometimes just Jemaa el Fna) is well covered in all guidebooks, online guides and blogs. 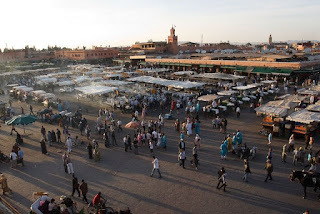 Its pictures are all over the web and books - an icon of Marrakech. 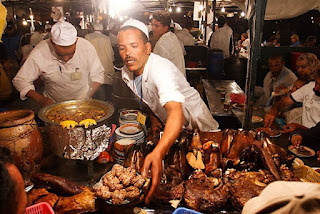 But really, D'jemaa el Fna is a place to be experienced, and no matter how much you read, how many pictures you see, once you're there, everything that you've read or seen will be completely pushed to the back of your mind, as your senses will be overwhelmed by D'jemaa el Fna. 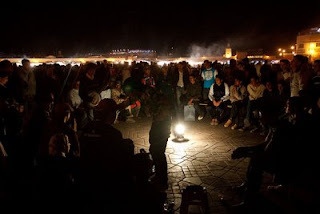 Being the grand square of Marrakech, it is as much used by the locals as visited by travellers. During the day, like any market square, stalls fill part of the scene. Orange juice stalls, snake charmers, roaming water "dispensers" in traditional costume and gears; these are but part of the strange mix of things you see in the square. But as afternoon morphs to evening, and night descends, the square slowly transforms. 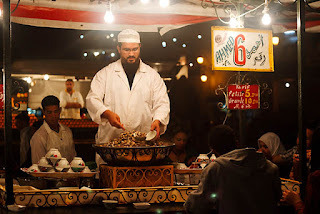 Carts pushed from all corners of the square converge to the centre, as food stalls prepare their gastronomical magic. Musicians and story-tellers appear, gathering circles of followers. Crowds thickened, and when night is complete, so is the transformation. D'jemaa el Fna is not just sight and sound. It is a concoction of sight, sound and smell. 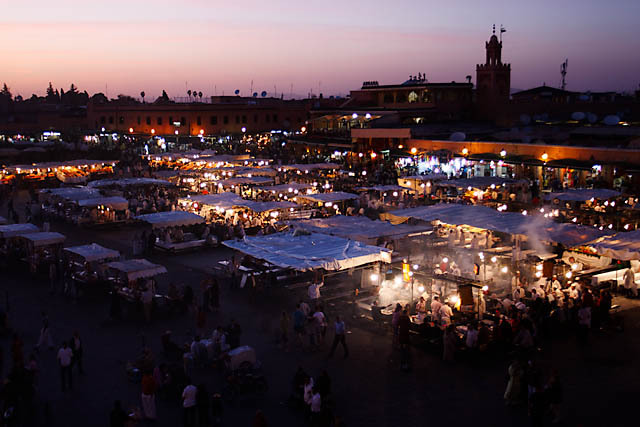 Add the spice of ambience that is Marrakech, and you have a destination that needs experiencing!